In a medium skillet over medium heat, combine onions, pepper, ground cumin, paprika and sugar. Season with salt and pepper. Cook until onions are translucent. Transfer to bowl and set aside. In that same skillet over medium heat, add a tiny drizzle of olive and blister your tortilla on both sides. Then on one side of the tortilla, add your onions and pepper mixture top with 5 shrimp. Then add a handful of cheddar cheese and a handful of pepper jack cheese on top. Fold over the tortilla, like an omelet and let the cheese melt. Transfer finished quesadilla to a cutting board and cut it in 3 wedges. Repeat this for each quesadilla. This will make 3 half moon shaped quesadillas. Transfer to plate and garnish with salsa, sour cream and parsley. Shrimp… excellent idea for Quesadilla. Don’t know why I never thought of it before! Thanks. 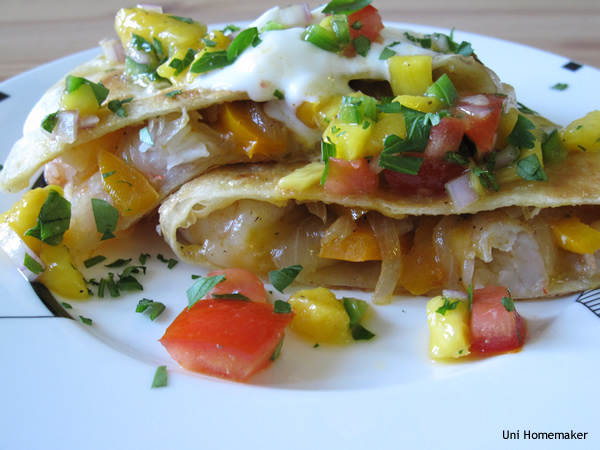 It’s fantastic with mango or pineapple salsa! Reblogging it on my new reblog page! You’re so kind, Judy! And thanks for the lovely comment, for bookmarking & reblogging. I hope you will enjoy the dish. Oh I haven’t had a quesadilla in forever!